Here’s what you need to know to protect your assets and secure an enjoyable lifestyle. 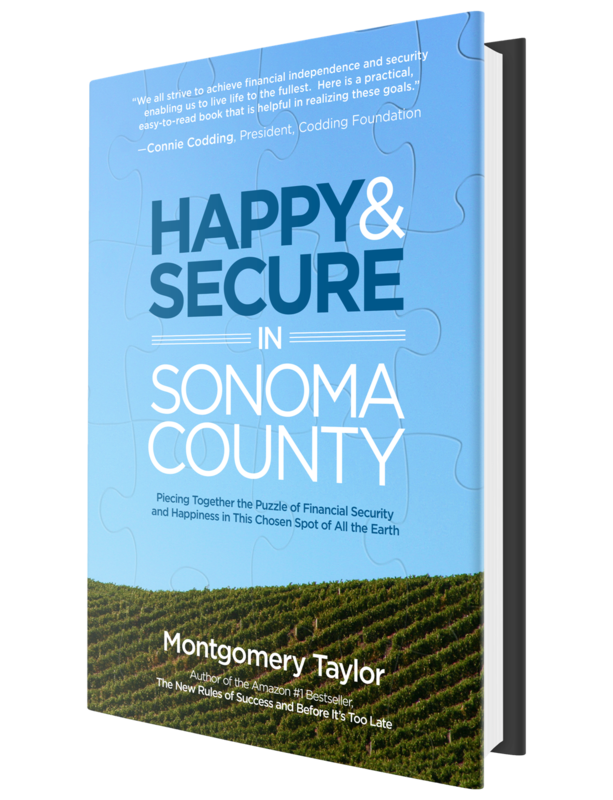 One of the most popular personal finance experts in Sonoma County, Montgomery Taylor goes beyond the usual finance book and lets everyday people tell their own stories of how circumstances, naiveté, failure to act, misinformation, and avoidance devastated their financial security. They go on to share what they’ve done with Taylor’s help, to become happy and secure. Taylor clearly describes how to safeguard your financial future through seven compelling stories: Meet Sharon, a sixty-six-year-old divorcee who lost her savings when a brokerage firm made high-risk investments on her behalf. Learn how you can avoid a similar financial disaster as the author guides you in how to find sound investment advice and closely monitor your investments. Or maybe you will learn from John and Amanda, who were feeling desperate about their finances but took the steps revealed here and can now avoid worrying over money. Taylor’s research shows that the amount of money you make has surprisingly little to do with how financially happy you are. But the happiest people in Sonoma County at all income levels tend to use the money strategies taught by Taylor and found in this book. The bottom line: You have to pay attention to your money—and Taylor shows you how to make the most of what you’ve got—but you don’t have to be rich to achieve financial happiness.